Has been working quite well for me. Ace card is pretty much esper because thanks to the eff's of pretty much the whole psychic part of the deck she can be recycled 10000x and its great for easy synchros to put quick and hard offensive pressure on the opponnent, her own effect is quite usefull aswell. 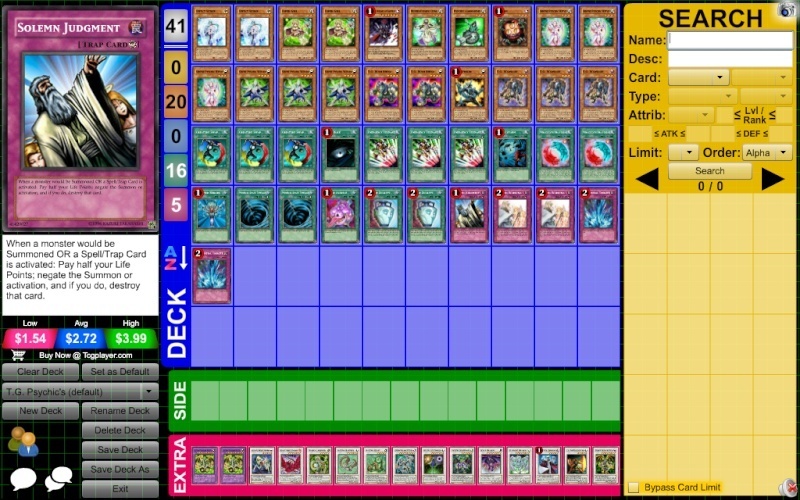 i havent yet lost with this deck(once though but thats because shockwave crashed during a duel so that doesnt really count e_e). Anyways i hope you guys will test it and have as much fun and success with it as me! Can't really give suggestions on what to fix here, since I'm not familiar with T.G.s or Psychics at all. Looks like a pretty solid build though, I'll test it out later tonight and see how it works. you can abuse pretty much every monster eff in your deck with it by Cswapping your monster to opp and killing it. Planshy wrote: Can't really give suggestions on what to fix here, since I'm not familiar with T.G.s or Psychics at all.